Weighing 60 tons and covered with military green paintwork the KMW Leopard 2 tanks might look less flashy than the fancy BMW 7 series but they have been IoT ready for much longer. Likewise, for wearables, an infantry soldier with a Sagem FELIN soldier system has been connected many years before the geekiest gym rat. From medical X-Ray to wireless transmissions during WW-I to GPS, there are numerous examples of military technology bootstrapping or at least vastly enhancing civilian technology. Nylon, canned food, penicillin have been progressed and industrialized during war time. UK-US development of Radar dates back to the joined Tizard Mission in 1940. The dawn of computing technology has been almost entirely military funded by the US MoD Whirlwind program, the Manhattan Project research seeded nuclear energy technology and WW-II rocketry research enabled the Apollo moon program. So what for our IoT interest group? We have the Global Information Grid (GIG): Military grade! IoT. 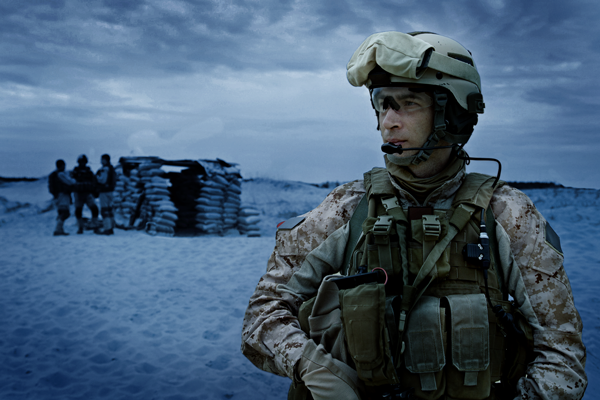 a globally interconnected, end-to-end set of information capabilities for collecting, processing, storing, disseminating, and managing information on demand to warfighters, policy makers, and support personnel. Potentially thousands of heterogeneous “devices“ sharing the right piece of information in real-time over a variety of links ranging from ad-hoc 9600 bauds tactical radio networks to broadband connections, to create a Common Operational Picture (COP). A COP is a virtual data space, like a “whiteboard in the sky”, where authorized connected things can write on and read from in a time and location decoupled manner, sharing as a result a common state of the world (…of things). Et voila! Thanks to the GIG, we have at hand the most powerful “Military Grade” IoT data sharing framework developed with hundreds of man years of the most expert software engineers with +10 years maturity and return of experience of hundreds of life critical projects, gathered by Big & Serious companies like Boeing, Thales, NG, GD, Airbus, NASA, Eurocontrol, Samsung (only to quote a few public examples). This GIG data sharing & management framework has been standardized by the OMG. it’s called DDS (Data Distribution Service) and it’s freely available as an Open Source (for example our DDS Community) and from a number of vendors proposing advanced features, consulting and support on top of the OMG DDS (for example our VORTEX IoT framework). So why reinventing the wheel? Some industry world leaders and IoT thought leaders like IIC consortium have already realized the benefit of DDS for IoT and I would encourage any forward looking member of our LinkedIN group interested in faster time to market IoT to have a closer look at this DDS. Lesson learned from my years of experience with GIG projects : ontology and data model design & ownership discussions are on the critical path and can be stumbling blocks when partner/competitors have to agree on a shared data model. Here again, it’s Déjà vu! Data model standardization and influence! Most of you must have been there before. I’m keen to keep in touch if you want to share ideas on this IoT/DDS topic.